Living in the Pacific Northwest, I’m more than familiar with the scent of rain. Wet asphalt, damp wool, slicked pine trees, moist dog — I know them all. To me, Miller Harris La Pluie doesn’t have much to do with rain, at least not with rain in my part of the world. Instead, it smells like something much more wonderful: Revlon Moon Drops perfume, my grandmother’s favorite. Miller Harris released La Pluie in 2011. Lyn Harris created it, and the fragrance has notes of tangerine, lavender, “wet” white flowers, ylang ylang, vetiver and bourbon vanilla. Initially, La Pluie is an aldehydic whoosh of tangerine and lavender with the ylang ylang already showing. Its citrus isn’t overtly juicy but leaves a dulled tangerine residue tinged with resinous lavender. For the first twenty minutes or so on skin, except for the aldehydes and the top edge of the citrus, it doesn’t smell much like my grandmother's Moon Drops. But once La Pluie’s moist, powdery, slightly spicy heart kicks in, Moon Drops comes back. (By the way, I haven’t actually smelled Moon Drops in years, so this is pure, unreliable scent memory at work.) La Pluie’s heart piles creamy ylang ylang on a touch of tangerine with maybe a pinch of carnation and buzzy jasmine. Its vanilla is subtle, and the vetiver gives the ylang ylang an island vibe. La Pluie’s humid floral powder brings back memories of being enveloped in my grandmother’s hug. She was a big woman (“More of me to love,” she’d say) and strong as an ox. Once one of my uncles brought home an exercise device made of four removable springs strung between two handles. To build your chest, you grasped the device’s handles and pulled them apart, stretching the springs. Between my father and three brothers, they managed a few repetitions at three springs, but no one could pull all four springs. Except grandma. She played it like it was an accordion. Despite her defensive tackle build, grandma was supremely feminine. She was a beautician during the Great Depression and wouldn’t leave home without a swipe of fuchsia lipstick and a dab from her green-marbled plastic compact of Moon Drops. (“Inside every woman is a little bit of a cat” she told me when I was barely old enough to see over the bathroom counter.) I wish she were alive so I could give her a bottle of La Pluie to replace her discontinued Moon Drops. La Pluie is a quiet fragrance and lasts about four hours with minimal sillage. It would be refreshing for a hot afternoon when you still need to be polished enough for the office. It’s not really my kind of perfume, but I might need to buy a La Pluie candle to summon my grandmother on those rough days when a girl needs a firm, warm hug. 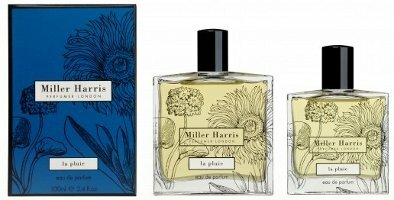 Miller Harris La Pluie Eau de Parfum comes in 100 ml and 50 ml bottles, and in a 6.5-ounce candle. For information on where to buy it, see Miller Harris under Perfume Houses. A bonus grandma story for anyone in the mood: When I was about 10 years old, I complained to my grandmother that the old saying went that “dogs are a man’s best friend,” but “diamonds are a girl’s best friend.” Didn’t that make women money grubbers? After all, dogs really are friends. Diamonds are just jewelry. “Honey,” she said and put down her dish towel, “If you’ve got a diamond, you can buy all the dogs you want.” She was a wise woman. Awesome grandma. And you’re totally right – i’ve been trying to remember what it reminded me of! From the notes I had ben expecting something sweeter and more modern – this is much more of a vintage style perfume, different to most of the feminine scents MH create. I had been thrown off initially because I’d heard it described as an “aquatic floral” and expected something loaded with ozone and melon. She was the ultimate grandma, in my opinion. A total five-star grandma. Aw, that’s so great! I’m not sure I realized there was a Moon Drops perfume. I love the classic Revlon lipstick names – so retro, so Americana. You made me interested in this perfume! That’s saying something because something called “La Pluie” was probably not at the top of my to-try list. Oh, and vintage Moon Drops, too. I need to get my hands on some Moon Drops! All I need for a complete grandma experience is some Moon Drops, a Barbara Cartland novel, and an open, optimistic view of the world. Wet grass is wonderful. I’m interested in responses, too. I get a lot of herbal notes from this one…not as subtle-flowery but reminiscent of Heeley’s Verveine. I wonder if the tangerine plays into that, too? Love, love reading about your grandmother. That last anecdote was just what I needed today. That diamond/dog story is hilarious. She sounds like a pistol mama. She was the best. She received five marriage proposals before deciding on my grandfather (who was also pretty terrific–a double for William Powell). THANK YOU Angela. I’ve been searching ebay and elsewhere for ages in an effort to find Moondrops perfume. (The cream foundation was wonderful too.) I’m thrilled about this. Must give it a try. If you do try it, please let me know if you smell the similarity with Moondrops! You can tell me if I’m hallucinating or not. Tangentially… Angela, I’d love to know if you think anything out there captures more of that true rain scent (which, for me, includes the creosote note from the Seattle waterfront!). Nothing I’ve smelled with rain in the name ever has. It would have to be something with vetiver, I think. I love the salt-air smell off the bay in Seattle, too. Hmm. I’ll have to think on this. Your grandma sounds like a wonderful person and you’re lucky to have her. Mine were “nice”…they were both extremely petite (< 5" tall) so the "more of me to love" applied to me more than to them :-). I'll have to add this to my STC Wish List for me to include in my next order unless I encounter it elsewhere first. My other grandmother is petite–bird bones and skin, just about. She’s a Youth Dew fan. What a cracking grandma! I would never have picked this up to sniff given its aquatic floral designation but I will now just to get a whiff of such a great lady. Your final anecdote is wonderful, by the way, and worth remembering! She really was an amazing woman. And I admit she changed my world view with the diamonds comment! Angela, wonderful writing as always, but it was your grandmother’s last quote that really made my day (and I am a confirmed dog lover)! Thank-you so much for sharing! I could talk about her for hours, I really could. I’m glad you enjoyed it! Part of the beauty of the story comes from seeing her say it, standing at the sink in the trailer’s master bedroom’s bathroom (hey, it was a double-wide). MH sent me a sample of this when it came out and quite liked it. “Wet white flowers” is a very accurate description, imo. The banana-lily-like ylang is dominant to my nose and at, times, vaguely reminds me of something like Vanille Galante. I didn’t find it particularly quiet or short lived, though (I dabbed from my sample onto fabric). It’s not a sultry powerhouse by any means but it had enough presence and lasted the day. I found it lasted really well on my sweater (as I discovered the next day!) but not very long on my skin. I’m glad it wears better on you. Hi Angela, I’m guessing your Moon Drops wearing grandmother is not the same as your Youth Dew wearing grandmother? Two very strong women in your life, by the sound of it. I didn’t know either of my grandmothers, sadly. Fortunately my daughter is well acquainted with one of hers. Adding: do you know Penhaligon’s Amaranthine? Is la Pluie anything like it? I have a bottle of Amaranthine, and La Pluie isn’t much like it at all. Amaranthine is much more lactonic, sultry, and assertive. La Pluie is more powdery and delicate (to me). …all scented with Youth Dew. What a wonderful post, Angela! I adored reading about your memories. La Pluie isn’t for me (your other grandmother’s signature Youth Dew was my first perfume love, though! ), but stories about amazing grandmothers are always fun to read. I visited my own grandmother just today. She doesn’t wear perfume any more, but she wore Shalimar once upon a time. It was before I was born, but I sure wish I had a scent memory of her in this classic scent! Aren’t grandmothers wonderful? They’re a loving portal into another world. And a Shalimar-wearing grandmother would be something else again! What a delightful reading, Anglea, your style is unmistakable! But it sounds like she had her own aroma you could associate with her, which is so nice! The fragrance doesn’t sound like my thing, but your grandmother does. I love the accordeon anecdote. I had one grandmother that I was very fond of. She was very different from yours but a great character as well. And a wonderful gran. Honestly, I think a good grandmother goes a long way to forming a happy adult. I miss her every day. I have a partial bottle of vintage Moon Drops. It has a very animalic drydown, which I love. It is Exhibit A for They Don’t Make Them Like They Used To: A fragrance that takes you on a journey from aldehydic top to animalic bottom, and is long-lasting to boot. All from a drugstore perfume! Well, then that’s one difference from La Pluie–I don’t get anything animalic from La Pluie. But I agree about those old drugstore fragrances. Revlon Intimate, for example, has a great animalic kick. Gosh, Angela. I just LOVED hearing about your grandmother. I had one “traditional,” cookie-baking grandmother and one grandmother who was more like Auntie Mame–This grandmother took pilot lessons not all that many years after Orville and Wilbur build the things. She was a force. I wish I could remember specific sayings of hers, but I can’t. What I DO remember is her spirit. Hooray for awesome grandmothers! Wow, a grandma pilot! I love that. I hope her spirit lives on in you (and I bet it does). Sounds like your grandmother and mine were spiritual twins. Must be a PNW thing. Thanks for reminding me of Moon Drops, which I haven’t thought of in years. Wouldn’t it be great to see a bunch of like-minded grandmas whooping it up over a game of pinochle? Musette wrote about this last fall – she was rebelling against the impending doom of cold weather and wanted something like spring rain. I was, too, and so I bought some unsniffed. Crazy, I know; fortunately, I really love it. La Pluie reminds me of FM L’Eau d’Hiver, but I often find the FMs a bit unremitting, and this is graceful. I’ve only worn it in fall and winter so far, obviously, but I think it will be great in spring and summer, too. I’m not familiar with Moon Drops, but this doesn’t seem like a vintage scent to me at all, but rather definitely modern. I’m glad that unsniffed buy turned out to be a success! I’d say (if memory serves) Moon Drops was more “classic” than “vintage” (or modern, really). I just popped the lid of my sample and sniffed again–and it really brings back my grandmother. Like everyone else, really loving the grandma stories: the exercise springs/squeeze-box story is a classic. I always forget about Miller Harris and hadn’t read about this one, but your review suddenly makes it strangely appealing: tangerine, lavender, ylang ylang, the comparison by A to Vanille Galante – sounds right up my alley. And you really got me with the lead-in: when it didn’t smell like rain, I thought this was going to a disappointment and then the “much more wonderful” comment was a very nice surprise. It’s much more wonderful if you have loving associations with Moon Drops! Otherwise I’m not sure it would be my thing. But it never hurts to sniff it if you get the chance. This is a really wonderful scent, Angela. It’s especially good in warm weather. I should think about getting more since my decant is almost empty. I haven’t worn it since last summer. Thanks for the reminder. Miller Harris does some great scents. I don’t know the Miller Harris scents nearly as well as I should. I’ll have to make a concerted effort to get more samples.